When Brian Okazaki (’18) walked into his first-year physics class, the last thing he expected was to see a professor wearing a space suit to teach a lesson about rockets. 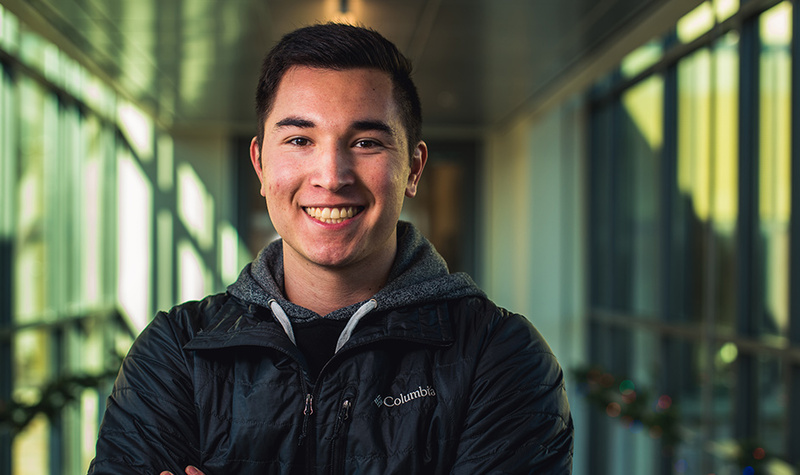 To this mechanical engineering major from Lake Forest Park, Washington, it was one of the many memorable and unexpected moments of his Gonzaga experience, which he has considered to be ultimately life-changing. Before coming to GU, Okazaki knew that a Gonzaga education was something he wanted, but he had to face the reality that it might not be within reach. Not one to think only of himself, Okazaki was concerned that even if his parents could provide for his education, his younger brothers might miss out. His mechanical engineering classes keep Okazaki busy, but he wouldn’t have it any other way. They’ve given him the opportunity to meet and work with some truly fun and caring professors, who have continuously shown care and concern for his progress, motivating him toward success in his field. Coming in, Okazaki knew that GU students were a tightly knit and caring bunch, but he was pleasantly surprised to learn that the Gonzaga community was largely influenced by compassionate faculty as well. Okazaki has high hopes for his future and out of gratitude, is looking forward to the opportunity to do the same for others that Gonzaga scholarship donors have done for him. Make a scholarship gift today and have in impact on Zags like Brian and through them, the world.